Fukuoka Johnan Church was established in 1931 as a member of Church of Christ in Japan (Nihon Kirisuto Kyokai). In the WWII period, we were forced to join Union Church of Japan (Nihon Kirisuto Kyodan) by the then government, and we were obliged to worship the Emperor, who were then believed to be the living God by Japanese people, before the formal worship started. This means that we could not resist the government’s command, and we indulged in idolatry without noticing it. This situation lasted for about four years. After the war, we restarted to worship God in the authentic way. In 1952, based on the deep repentance for the past deed of idolatry and support in any way of Imperial Japan, the present Church of Christ in Japan (CCJ) was organized with the same name, and in the same year we joined this denomination. 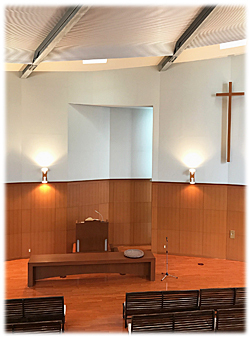 CCJ inherits the faith and tradition of Reformed and Presbyterian Churches of Europe and the U.S.
Fukuoka Johnan Church welcomes anyone of any nationality. Please feel free to visit us, and let us worship God together. Our worship starts at 11:00 a.m. every Sunday. Young children are also welcome to Sunday School, which starts at 10:00 a.m. every Sunday.Our choir meets at 10:00 a.m. every Sunday to practice and frequently contributes to the service. Anyone is welcome to join the choir. Sunday Morning Worship：　11:00 a.m.
Sunday School (Junior Church)：　10:00 a.m.
House Group Meeting：　4th Thursday from 1:30 p.m. Ask for details. Prayer Meeting：　every Wednesday from 10:30 a.m. and from 7:30 p.m.